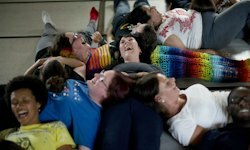 LAUGHTER YOGA: Laughter Yoga is a great activity to get people in high spirits for HEN PARTIES. It’s an interactive, unforgettable girly-bonding experience which suits all ages as its not strenuous and you don’t need any prior experience. Laughter yoga involves a combination of breathing exercises, child-like playfulness and laughter exercises to produce laughter for prolonged periods of time. What a perfect way to start any hen party! Make your Hen party stand out from all the rest and try Laughter Yoga!